The Shot Tower, when it was built in 1828, was the tallest structure in the United States until 1846. Once there were three such towers in Baltimore; now there are only a few left in the entire world. The design of the 215-foot tall Phoenix Shot Tower and its estimated 1.1 million bricks is based on Englishman William Watt’s 1782 patented process of making shot by pouring molten lead through colanders down the open shaft of a high tower. As the molten lead spun and cooled in the air, it became “perfectly globular in form and smooth” as was reported at the time. The “drops” were collected in a large water barrel at the tower’s base, then sorted by size and bagged for distribution. The finished product was called drop shot and was used for small game hunting, among other things. The Shot Tower annually produced 2.5 million pounds of it until 1892 when new methods of shot production made the Tower obsolete. In 1921, permits were granted to tear down the Tower and clear the site to make way for an automobile garage. In one of the first acts of historic preservation in Baltimore, public reaction against the demolition plans was strong, and leading citizens were able to raise funds for its preservation. 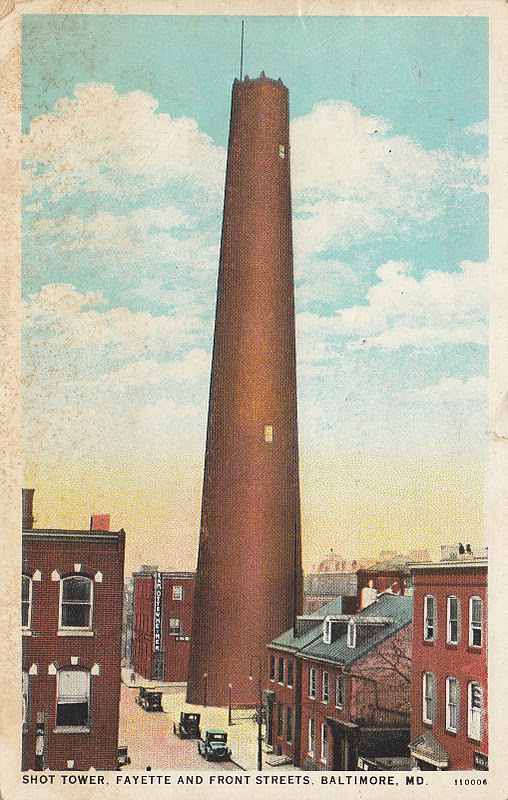 On October 11, 1924, a group of Baltimore citizens bought the Shot Tower for $17,000 and donated it to the city with the understanding that it would be preserved. More than fifty years passed before the Shot Tower was opened to the public as a museum. In 1973, it was placed on the National Register of Historic Places. Today it is managed by Carroll Museums, a non-profit organization that also manages the Carroll Mansion on nearby Pratt Street. Marsha Wight Wise, “Phoenix Shot Tower,” Explore Baltimore Heritage, accessed April 19, 2019, https://explore.baltimoreheritage.org/items/show/200. Published on Feb 22, 2013. Last updated on Nov 27, 2018.